The Go Pod Activity seat is designed to grow with your child; it can adjust to four different height settings as your child grows. It is specifically design for children four months to walking and ensures that their legs and feet are in the proper position for maximum comfort. When it is fully folded up it fits neatly in its carry bag. 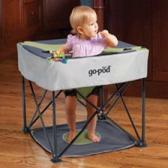 It is perfect for inside and outdoor use and it comes with an attached floor mat that keeps your baby’s feet safe.